I see a connection here with my recent HBR post, which emphasizes the importance of ignoring the unimportant in order to focus our time and attention on those people and issues that truly matter. We often approach this process as an intellectual task of prioritization, but it's a fundamentally emotional experience. The choice to ignore certain people and issues in favor of others stirs up a complex range of emotions--particularly anxiety, fear and guilt--that can be difficult to manage and can easily cause us to make decisions that aren't in our best interests. Graham's master monk is an exemplar of emotion management who points the way for mere mortals like the rest of us. In the face of a bandit's sword, he values devotion to his meditative practice above all else. He chooses where to focus his time and attention, and even the threat of losing his life isn't sufficient to deter him from the pursuit of his goals. Being distracted by fear and allowing the bandit to determine where he should focus his attention would be the greater loss. I'm not suggesting that we should be suicidally cavalier when confronted with legitimate threats. But I do believe that we often see sword-wielding bandits where there are none, and when we do, we scatter like so many lesser monks, allowing the perceived threat to determine our course of action. Adjust our mental models to reflect emotions' importance and the role they play in rational thought and decision-making. Our beliefs shape our experience. Take better care of ourselves physically. Regular exercise and sufficient sleep demonstrably improve our ability to both perceive and regulate emotion. Engage in some form of mindfulness routine. Meditation, journaling and other reflective practices enhance our ability to direct our thoughts, helping us sense emotion more acutely, and provide a new perspective on our experiences, helping us make sense of those emotions. Expand our emotional vocabulary—literally. Having a wider range of words to describe what we’re feeling not only helps us communicate better with others, but also helps us to more accurately understand ourselves. Triage under optimal conditions: Determining what we should pay attention to (and what we should ignore) is a mentally and emotionally taxing task, and we should undertake it when our reserves of mental and emotional control are at their highest. Too often we tackle this important work when we're already stressed--do it early in the day or after a break instead. Reflect on the benefits: Our natural negativity bias is enhanced under stress, and when we choose to ignore demands for our time and attention, we fixate on the disadvantages and things that might go wrong. But freeing up our time and attention for truly important people and issues inevitably yields benefits--the return on our investment of those precious resources is greater when we spend them accordingly. Spending a few minutes reflecting on the benefits we expect to realize by dedicating ourselves to our most important tasks can strengthen our resolve. Challenge our threat response: Our brains and bodies can respond to certain interpersonal experiences just as if we were facing a physical attack, a phenomenon known as social threat. But when we experience any form of threat response--also known as a "fight, flight or freeze response"--our cognitive abilities are substantially diminished. It's important to recognize the telltale signs of our own threat response, which can range from a racing heart and sweaty palms to feelings of aggression or defensiveness, and to arrest the process as early as possible. Sometimes what looks like a sword-wielding bandit is just a shadow or a wisp of smoke. 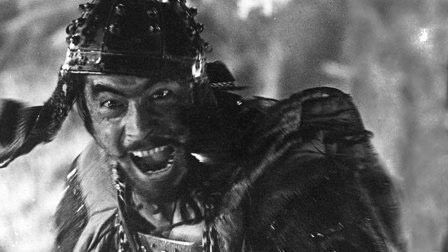 Video still from Akira Kurosawa's Seven Samurai courtesy of The Criterion Collection.